8 Jewelry Trends to Wear this Fall! You probably know that my mission with H*O*T is to get every woman (especially those who might be feeling a bit stale when it comes to style) to understand the power and usefulness of accessories when it comes to one's personal style and dressing. So imagine how happy I am to see that for Fall/Winter 2018, accessories are set to play a major role in your cold-weather wardrobes. This season jewelry is bold and in your face, lending originality and individuality to your sartorial style. Here are the top trends for jewelry for the new season. And remember you can click right through and buy great pieces on H*O*T that nail each and every one of these trends. Many of the items for each of the trends are available on HOUSE OF TERRANCE. Click through the pictures to see if they are still available. Well this makes sense given that it's autumn! We love this trend because leaves really are so beautiful. They come in many graceful, delicate and organic shapes and look gorgeous in any metal and any size. They work wonderfully as earrings, pendants and even rings, so this fall why not fall for falling leaves? 2. The Stack is Back! We're happy to see the return of one of our favorite trends filed under the 'more is more' category. 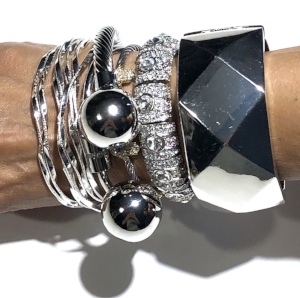 Stacking up a playful and eye-catching line up of cool bangles, bracelets or cuffs is the quickest way to communicate your style savvy to the world. Don't over think it, just pile on your favorites in any combination of materials and colors. Go ahead and create a work of art on your arm this fall! I'm the first to admit that I've never been a big fan of fashion items with a western theme (I was rooting for the Apaches on all those old black and white Cowboys and Indians shows back in the day:) But there is something fresh about the new takes on the Wild West especially if you like feathers in all their iterations. So this fall just Go West Young Woman, it's your manifest destiny! You might ask, what more could we possibly have to say about hoops that we haven't already said? Plenty it turns out. I for one love a hoop earring more than any other. 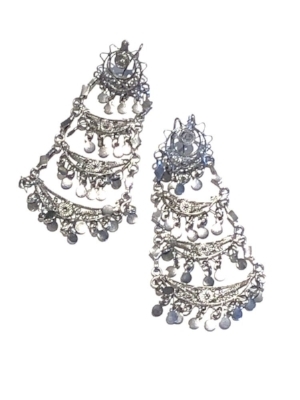 It's the most versatile earring and is always appropriate for absolutely every occasion. 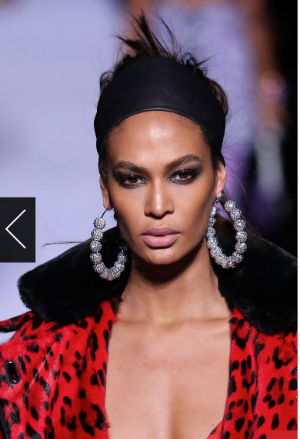 I don't think they have ever been "out" and this season hoops have gotten even more creative featuring orbiting stones, oversize shapes, and unique modern materials. 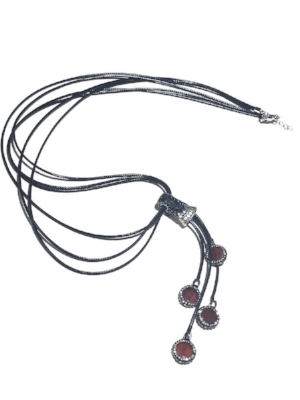 Necklaces and bracelets featuring plenty of fun, quirky charms are a major and welcome trend this season. Besides having major collectors appeal they also have that wonderful magpie quality that you can't tear your eyes away from. 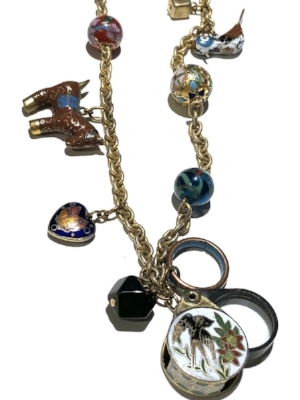 I recently shared on Instagram a Pinterest photo of Jackie O's vintage charm bracelet and it got tons of likes and musings about the stories behind each charm. Yes, those wild and crazy years filled with shoulder pads, pouf skirts, and hot pink are back in a big way. Adding 80s jewelry like big gold chains, doorstopper earrings, and massively oversized baubles is the easiest way to update your look in this direction if that's what floats your style boat, it does mine! Fortunately, there's an entire vintage section on H*O*T filled with original 80s pieces purchased and worn by me in the 80s! You don't think jewelry is just made for ears, wrists, fingers, and necks do you? This season we're seeing a real interest in pieces that can be worn like armor (hey we're all looking for some added protection these days!) or pieces that drape across one's whole hand, foot and ankle or waist and hips even. It's a bold statement but a trend you can ease into. 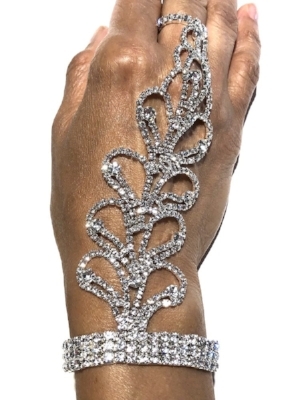 Consider this eye-catching hand jewelry from our site. We just can't seem to get enough of major ear adornment! 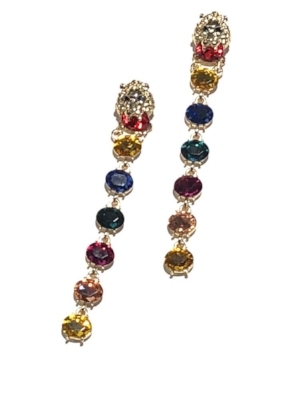 This fall indulge in unique earrings that get you noticed. Wearing a pair of special earrings is an easy way to nail this season's trends no matter your personal style, there's something for everyone. Oh, and btw, this includes the loud statement made by the bold over-the-top single earring as well as the very of-the-moment mismatched pair. Introducing Colleen Brand and Her Amazing African Baroque Textile Jewelry!